What makes the new BangoMatic so special? First off this head is cast! Casting is 2 to 2 1/2 times more then forging and you must have a tooling made for each loft versus (1) tooling for all lofts on forgings. Is casting better then forging? No! Just more consistent! But to accomplish what we wanted to which is Flow Alignment (FA) I had to cast. The finished product is Black to match all shafts - 5 coats of Gloss Black non-peel resistant paint. It will include a high quality headcover! When you see the Bang-o-matic you will be truly dazzled by this type of quality in original design. Right hand or left hand senior lofts: 4.5, 5 (RH), 6, 6.5 (RH), 7.5, 9, 10.5, 12, 14, 16, 18 (RH) 20 (RH). 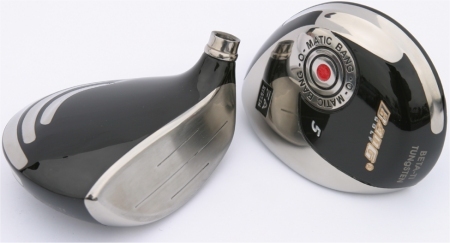 At Bang we are truly excited about the Bang-O-Matic fairway woods. Made of the finest Beta Ti and higherst grade titanium available, these are the best performing fairway woods you will ever hit. They are so easy to hit, it's like cheating...but they are legal! 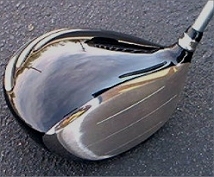 I can honestly say they will knock every other fairway wood out of your bag. at Bang, we really outdid ourselves with these puppies. Contact us for an assembled quote with your choice of shafts.